Apple Pie Tartlets - A Guest Post by Heena Rathore ~ Full Scoops - A food blog with easy,simple & tasty recipes! Today I'm happy introduce a 'budding' blogger Heena! She blogs at TheBaking Bud, TheCooking Bud and The Reading Bud. The first thing that attracted me to Heena's blogs were the names. I simply adored it! In fact, I was slightly annoyed with myself for not thinking hard enough to come up with such an innovative name for my blog! 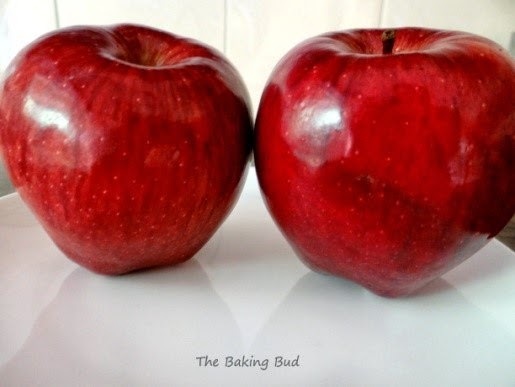 Of her 3 blogs, my favorite is The Baking Bud. Simply because I love desserts and I LOVE chocolates! Her baking blog is like disney land to me! So many chocolate recipes. I shamelessly drool over all the yummy recipes! And that's how I asked her if she would write for me. I'm really glad she agreed! I've never made tartlets before and this is a wonderful recipe. Hope you guys will enjoy this recipe as much as I did. Oh and also, hop and skip over to her blog and have a look for yourselves! Hi fellow bloggers and chefs. My name is Heena Rathore P. and I am the proud author of TheBaking Bud and TheCooking Bud. I live in Pune, Maharashtra and I love to bake and cook. First of all I would like to thank Beulah Arun, author of Fullscoops for giving me an opportunity to do my first guest post for this wonderful and unique blog. Beulah is very caring and has helped me in all the possible ways she can. She has been very considerate about the fact that this is my first guest post and has been extremely encouraging. 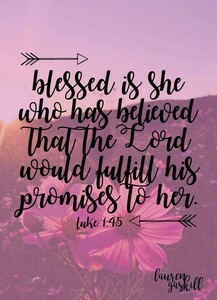 She cleared all my doubts very patiently and I am really grateful for her generosity. I am very glad to have met her and to be one of her followers. I love her recipes and have tried out the Whole Wheat Oats Nutella Bars and they came out amazingly perfect. For the post I chose Apple-Pie Tartlets as many of my friends believe I am good at making tarts and also as Beulah suggested something baked for the post. Apple-Pie Tartlets are my take on the classic Apple Pie. These adorable little cuties look so beautiful that they can make you fall in love with them instantly. I always prefer tarts over pie (and cup-cakes over cakes!). They give you the freedom of eating just how much you want to eat. It really breaks my heart to ruin the entire pie for just a bite. But with tarts I can just have one for craving sake and the others remain untouched. Tarts are also very easy to serve. You can mount a scoop of your favorite ice-cream per tart and serve easily. And the kids love it too. Chilled Water: 1-2 tsp only if needed to make dough. 1. 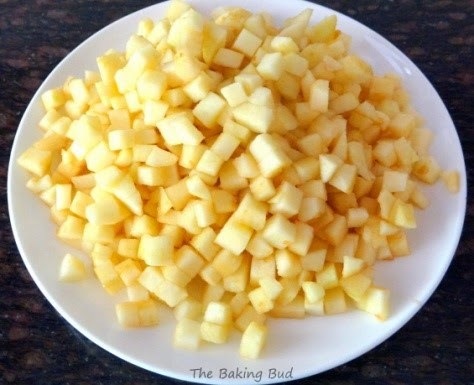 Chop the apples finely. 2. 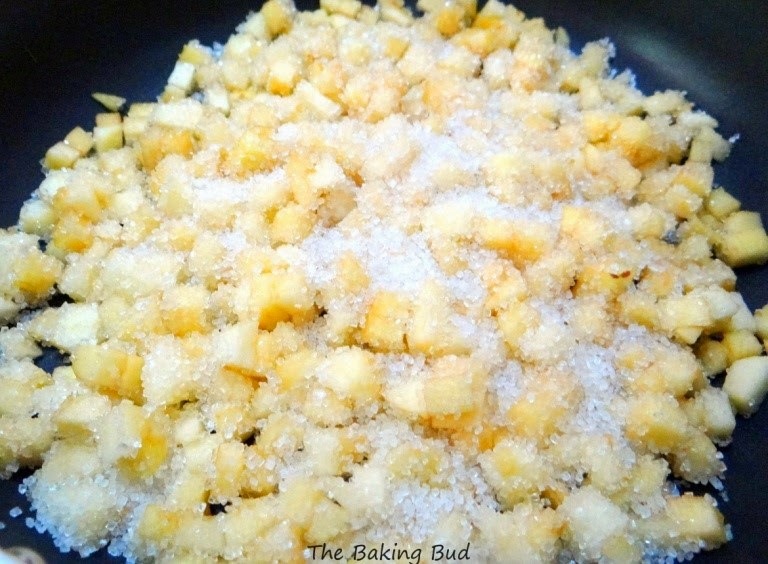 Take a heavy bottom pan and add the chopped apples and sugar to it. 3. Add water and cover the lid. Let it simmer on low flame for 15 minutes. 4. 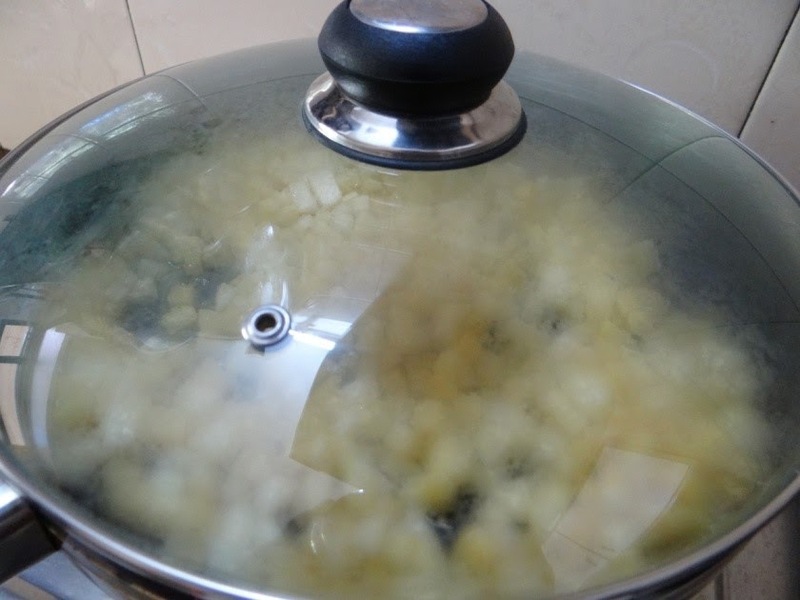 When the sugar releases water and the apples become soft, take the lid off the pan and let the water evaporate. 5. When the apples become slushy take them off the gas and let the filling cool down to room temperature. 1. Preheat the oven to 150°and line the tart moulds. 2. Sift flour and baking powder in a mixing bowl and add sugar and butter. 3. Mix them gently using your finger tips or with a hand beater on low speed. 4. You will get a crumb like mixture. 5. Try and make a ball of the dough. If it's not coming together add chilled water just enough to make the dough come together in a ball. 6. Wrap it in a cling foil and keep in the fridge for 10 minutes. 7. Dust the rolling surface with some flour and roll out the dough (handle the dough very carefully). Don't worry if the dough breaks. 8. Cut out big enough circles that can cover your tart moulds. 9. Arrange and press the rolled out circles in lined tart moulds. 10. Take a fork and prick the pastry. Keep in fridge for about 10 minutes. 1. Take out the tarts from fridge and fill with fillings. 3. Keep in the baking tray and bake for around 10 minutes or till the leave the sides of the tart moulds. 2. For extra flavoring you can add 1/4 tsp of lime juice and a pinch of cinnamon powder in the filling. 3. Make sure that the butter used for tarts is chilled. 4. You can use chilled milk also to pull the dough together. 5. While mixing the flour and butter, be careful not to over mix them. 6. You can increase the quantity of butter to 100g if you want very flaky texture. Stunning. Lots of work but all worth the outcome. Beautiful pies made to perfection. Love the caramel taste of the apple filling. Looks yummy and is also easy to try! Hi Heena, The tarts look yum and scrumptious! The simple recipe and individual serving size pushed me to try your recipe. It was part success. The filling turned out great and the over all taste was good too. But for some reason my tart shells didn't hold shape. They just sort of crumbled. Any idea why this might have happened? I am planning to give it a try again. Shwe... Thanks a lot and I am glad you tried it. I make these with the same measurements but they come out good. Make sure that the butter was cold enough and that you keep the dough long enough in the fridge. Also try reducing the amount of butter by 10 grams (if they were crumbled just by the touch then reduce it by 25 grams). They should come out solid and nice with these changes. Thanks a lot for getting back...! Perfect tartlets..Looks so cute n yummy..